The 1Gb DDR3 SDRAM E-die is organized as a 32Mbit x 4 I/Os x 8banks, 16Mbit x 8 I/Os x 8banks or 8Mbit x 16 I/Os x 8 banks device. This syn- chronous device achieves high speed double-data-rate transfer rates of up to 1600Mb/sec/pin (DDR3-1600) for general applications. 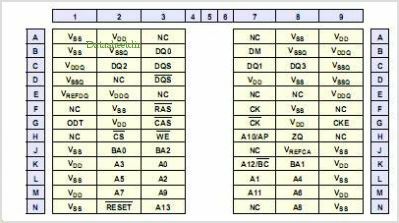 The chip is designed to comply with the following key DDR3 SDRAM fea- tures such as posted CAS, Programmable CWL, Internal (Self) Calibra- tion, On Die Termination using ODT pin and Asynchronous Reset . All of the control and address inputs are synchronized with a pair of exter- nally supplied differential Clocks Inputs are latched at the crosspoint of dif- ferential Clocks (CK rising and CK falling). All I/Os are synchronized with a pair of bidirectional strobes (DQS and DQS) in a source synchronous fash- ion. The address bus is used to convey row, column, and bank address information in a RAS/CAS multiplexing style. The DDR3 device operates with a single 1.5V ± 0.075V power supply and 1.5V ± 0.075V VDDQ. The 1Gb DDR3 E-die device is available in 78ball FBGAs(x4/x8) and 96ball FBGA(x16) By Samsung Semiconductor, Inc. This is one package pinout of K4B1G0446E,If you need more pinouts please download K4B1G0446E's pdf datasheet. K4B1G0446E circuits will be updated soon..., now you can download the pdf datasheet to check the circuits!